Moorlands produced a superb batting display which set the platform for an impressive 181-run victory over previous Drakes Huddersfield Premiership leaders Thongsbridge last Saturday. The win sees Moorlands hold a share of pole position with Delph and Dobcross and Hoylandswaine after the opening three matches. Eddie Walmsley, a close reason recruit from Bradford League side Methley, was the mainstay of the Moorlands innings as he hit a splendid 167 not out. Walmsley’s unbeaten innings came off 123 balls and included 18 fours and nine sixes as he took a liking to the Thongsbridge bowling attack. Another new signing, Nathan Rabnott (87) continued his fine start to the season with the bat as Moorlands racked up an impressive total of 373-5, despite Thongsbridge using seven different bowlers in an attempt to stem the flow of runs. R Marshall (34) and A Kemp (61) led the Thongsbridge reply but they were dismissed for 192 as Walmsley followed up his superb knock with the bat by taking 3-36. The sides are set to meet again in the Sykes Cup second round, with the tie to be played on Sunday June 3 with the following week set aside as a reserve date. Mirfield Parish Cavaliers recorded their first win in the top flight as they defeated Cawthorne by seven wickets. Cawthorne stunned the Huddersfield League following this defeat by handing in a letter of resignation on Monday as they have indicated their intentions to play their cricket elsewhere in 2019. Daniel Broadbent (4-49) and Connor Rowlands (4-48) produced impressive bowling spells to restrict lowly Cawthorne to 164 all out with Lewis Skelly (49) their top scorer. Wicketkeeper Muhammad Ali followed up his two catches in the Cawthorne innings by making 84 not out from 101 balls as Parish eased to their target in just 34 overs. 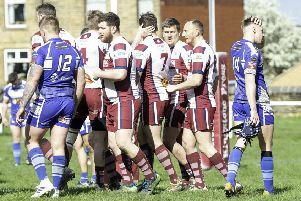 Moorlands welcome fourth placed Honley to Memorial Park on Saturday, while Parish aim to build on their first win when they travel to Kirkburton, who have also won one out of their first three league games and are just above them in the early standings. Mirfield eased to a nine-wicket win over Thurstonland and have climbed up to fifth place in the Conference. Mirfield are now just four points behind joint leaders Denby and Hall Bower following a second successive win. Nas Saudagar (3-44) and B McGuinness (3-74) combined with some fine bowling which helped restrict Thurstonland to 191-8. J Booth led the way with 57, while support came from T Broom (27), K Ahmed (25) and S Malik (32). Mirfield were led to their target by a superb knock of 131 by captain Adam Goldthorpe, while support came from Joshua Ramsay (45) as the home side eased to victory. Mirfield face a trip to Marsden on Saturday with the home side just a place below them in the early Conference table.